At the beginning of January, Bondings 2.0 reported on London’s Soho Masses for the LGBT community being transferred to a new location and operated under a different model of pastoral ministry. That story made headlines because the Soho Masses were a pastoral accommodation made by Archbishop Vincent Nichols of Westminster, but had also been the subject of some criticism by conservative Catholics, reaching to the Vatican. This past Sunday, the Soho Masses community moved to their new location at the Jesuit-run Immaculate Conception parish, Farm Street, in the Mayfair section of London. In the new model of ministry, the LGBT community will not have a separate Mass, but will attend the Sunday evening Mass of the parish with the rest of the worshiping community. Additionally, the Soho Masses Pastoral Council will work with the parish to expand outreach and ministerial programs to the LGBT community of London. 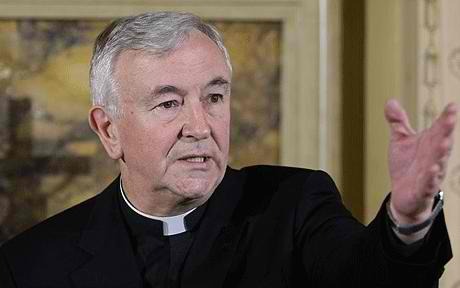 When the change had been announced, there had been some suggestion that Archbishop Nichols was forced by the Vatican to try to close down the pastoral outreach. His presence at the first Mass to welcome the community shows that he is firmly committed to making the church a welcoming place for LGBT people. His gesture shows how pastoral leaders can help to ease any discomfort that a change may entail, and it also stands as an example to the rest of the faith community about the importance of welcoming LGBT people. Here in the U.S., LGBT Catholics have sought such opportunities for many years, with few opportunities to dialogue with a bishop. Weldon’s post describes the event in full, and he also corrects some of the inaccuracies of a press report of the event. You can read his entire comments here and here. If you want more information on this topic, they are an excellent resource. We pray the Soho Masses community receive every blessing as they settle into their new pastoral home. We pray, too, that similar models of ministry here in the U.S. be accorded the pastoral support that Archbishop Nichols has demonstrated. Wouldn’t it be wonderful if bishops in the US expressed such openness. I’m sure that the Dignity community of Washington, DC (D/W) would welcome a visit from Cardinal Donald Wuerl, who lives just a few blocks from the episcpoal church where D/W gathers for Eucharist every Sunday night at 6:00 pm. This model reminds me happily of the longstanding pastoral vision of inclusivity that characterized the Jesuit parish of St. Francis Xavier on 16th St. in New York City. We certainly wouldn’t want the LGBT community having separate Masses like the SSPX or that personal prelature of note, Opus Dei. There are plenty communities that are accomodated with special Masses but we can’t have that with the LGBT community, can we?